Sorry, The Loyalty Bundle promotion is over. If you'd like to be notified about future bundles, please enter your email below. 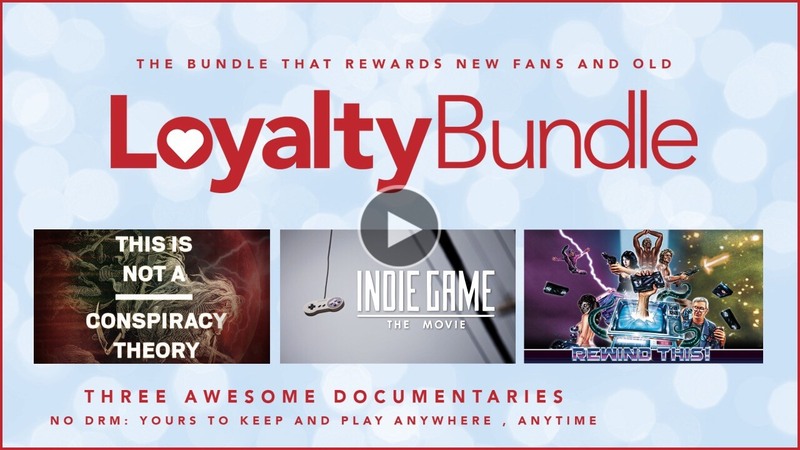 The Loyalty Bundle is the bundle that rewards new fans and old. Three awesome documentaries, one fantastic bundle: This is Not a Conspiracy Theory, Indie Game The Movie, and Rewind This! New fans get all three films for just $15. There’s no DRM and they’re yours to play anywhere, anytime, on any device. But what if you’re an old fan? Typically, existing fans get left out in the cold by bundle promotions. We don’t like that. We don’t think you should made to regret purchasing early, so we’re making the entire bundle available for free to existing fans. If you’ve already bought one of these films on the VHX platform, just click the button at the bottom of this page, enter the email you used for your purchase, and the bundle is yours at no charge. That’s The Loyalty Bundle. New fans: get all three films for just fifteen bucks. Old fans: get the bundle for free. Either way, get it now because this offer ends January 1st at midnight. The Loyalty Bundle also makes a great gift. When you checkout, click the gift option and choose to have it delivered on Christmas morning. Rewind This! tells the story of the enormous cultural and historical impact of VHS tape. This documentary traces the ripples of that impact by examining the myriad aspects of art, technology, and societal perceptions that were altered by the creation of videotape. Already own one of the films offered? Enter your email below to reward your loyalty!